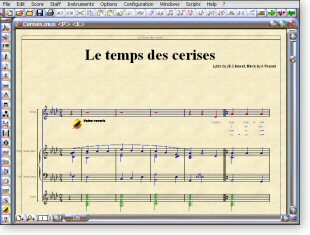 Harmony Assistant is an software for computer-assisted music composition and editing. Its harmonizing capabilities enable the composer to build quickly and efficiently tunes that include accompaniment, multiple instruments and drum patterns. Posted by Eric J. Leopold on Sun, 01/18/2004 - 17:20.
: Harmony Assistant on a Mac with OS 10.2.6 allowed me to compose and arrange 11 jazz tunes in 2 months. I burned the tunes to a CD. I sent copies to friends and they loved it. This is a great learning tool and a new way to experimental music. Great fun to write music you could never play on your axe especially if you've gone beyond rusty. Mac fans, Harmony Assistant works great on the new OS 10.3.2 AKA Panther. Panther is snappier than Jaguar OS 10.2.8. I'm glad I switched. My progress with Harmony Asistant is now 4 CDs to friends and players with favorable response. Posted by Eric J. Leopold on Sun, 06/29/2003 - 05:50. Harmony Assistant on a Mac with OS 10.2.6 allowed me to compose and arrange 11 jazz tunes in 2 months. I burned the tunes to a CD. I sent copies to friends and they loved it. This is a great learning tool and a new way to experimental music. Great fun to write music you could never play on your axe especially if you've gone beyond rusty. Posted by Michael Pemberton on Mon, 05/19/2003 - 09:34. I am not sure what program to use to open a bin file. I am using Win XP, and have downloaded the demo. How do I install? Posted by james on Mon, 05/09/2005 - 12:48.
: I am not sure what program to use to open a bin file. I am using Win server, and have downloaded the demo. How do I install? Posted by James Pimenta on Mon, 11/08/2004 - 18:58.
: I am not sure what program to use to open a bin file. I am using Win XP, and have downloaded the demo. How do I install? Posted by moinansari on Wed, 12/03/2003 - 17:52. Posted by Arvind, India on Tue, 05/20/2003 - 13:38. Bin files are Mac compatible. You can use google search for this purpose. Posted by Shashank Dixit on Mon, 09/01/2003 - 10:03. Use Deamon Tools or WINISO. Google for Deamon tools/WINISO. Posted by Susana Crofton on Tue, 04/16/2002 - 02:14. I am looking for a music software program that TRANSPOSES scores I key in. I do not use MIDI. I don't want or need anything MIDI related. I simply would like to be able to key in a score and then TRANSPOSE it, if necessary, to any other key. I would also like to be able to print out the scores as well as their tranpositions. Wondering if you know of any such program. Posted by Toto Santoso (via moderator) on Thu, 09/11/2003 - 23:41. You can try with software CakeWalk Pro Audio 9, and you can print a notation or scores, or transpose key or change with the other instrument music, and you can show or print the tab guitar for easy playing guitar. I guarated this software is easy to use and can edit track until 255, or you can conect with keyboard instrument for record midi data, or write with direct notation scores, and playing it. : I am looking for a music software program that TRANSPOSES scores I key in. : I do not use MIDI. I don't want or need anything MIDI related. I simply would like to be able to key in a score and then TRANSPOSE it, if necessary, to any other key. : I would also like to be able to print out the scores as well as their tranpositions. : Wondering if you know of any such program. Posted by Ted Ellis on Sat, 04/19/2003 - 09:55. Try Noteworthy Composer at www.ntworthy.com Its easy to use, powerful and only US $39 I have used it for 4 years. Posted by optimun130 (via moderator) on Tue, 06/10/2003 - 21:43.
: Try Noteworthy Composer at www.ntworthy.com Its easy to use, powerful and only US $39 I have used it for 4 years. : : I am looking for a music software program that TRANSPOSES scores I key in. : : I do not use MIDI. I don't want or need anything MIDI related. I simply would like to be able to key in a score and then TRANSPOSE it, if necessary, to any other key. : : I would also like to be able to print out the scores as well as their tranpositions. : : Wondering if you know of any such program. Posted by Val on Sun, 04/21/2002 - 20:37. You can try Nightlight, the free version of Nightngale. Ok, it has MIDI options, but they're disabled until you install any MIDI manager software, and as it is simple to use, you might find it useful. It has transposing options. The system requirements are minimum, too. Posted by John Rosati on Sat, 03/18/2000 - 06:56. I would like software that will let me print notes on blank music sheets. I write songs and would like to print my own songs. Thank you. Posted by Matt O'Connor on Thu, 12/12/2002 - 13:28. I would much appreciate some music notes for very begginers on the acoustic guitars. Thank you. Posted by stephanie on Sun, 08/10/2003 - 19:00.
: I would much appreciate some music notes for very begginers on the electric guitars. Thank you. Posted by stephnanie ward on Sun, 08/10/2003 - 19:01.
: : I would much appreciate some music notes for very begginers on the electric guitars. Thank you. Posted by Cecilia Muchai on Sun, 03/02/2003 - 15:58.
: I would much appreciate some music notes for very begginers on the acoustic guitars. Thank you. Posted by michael brown on Mon, 10/21/2002 - 18:02.
: I would like software that will let me print notes on blank music sheets. I write songs and would like to print my own songs. Thank you. Posted by Amanda on Sat, 03/23/2002 - 03:48. Posted by tammy on Thu, 02/21/2002 - 21:44. Posted by jose on Mon, 07/28/2003 - 04:01.
: : I would like software that will let me print notes on blank music sheets. I write songs and would like to print my own songs. Thank you. Posted by Leticia Mendoza on Wed, 06/11/2003 - 20:35. Posted by kelly on Thu, 12/26/2002 - 09:05. Posted by S.Hooter on Fri, 11/09/2001 - 21:20. Posted by anthony on Mon, 09/11/2000 - 03:42.